The tree is decorated and Little Horse has just been placed on Cory's mantel when Owl, a tree trim sitting next to Little Angel, announces that Santa is outsourcing and Santa's helper, Jasper, is coming to interview. They find out he is looking for reindeer to help deliver presents. "No reindeer here," all the tree trims announce, "We have Little Horse!" Despite Jasper's doubts about Little Horse's qualifications, he hires Little Horse when Owl make him a deal. But what is the deal, Little Horse wonders and can she do the job, after all, she isn't a deer! Can she save Christmas for Cory? 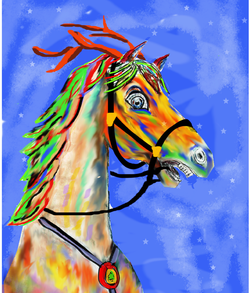 Find out in this seven-chapter tale that takes Little Horse on a zany and surprised-filled Christmas Eve journey. The Little Horse Wears Antlers story provides a great opportunity for children to teach the older generation about technologies they are especially interested in and for grandparents to tell how celebrating special holidays was different for them when they were growing up. Subject: Holidays: Family: An ideal teachable moment for discussion about good and bad job qualifications. Are antlers, a red nose, looking like a deer, or be a deer necessary? Skin color, gender, what you look like, how important? What is important? This is a Seven chapter story with colored illustratons for each chapter as well as logo header. NIE - Attention Discount a flat rate of $55.00 regardless of distribution number. Order now to receive discount. IE! The Little Horse Christmas Series. Don't miss the discount on each of the two stories of These two stories. $55.00 Flat rate regardless of distribution numbers until October 1.